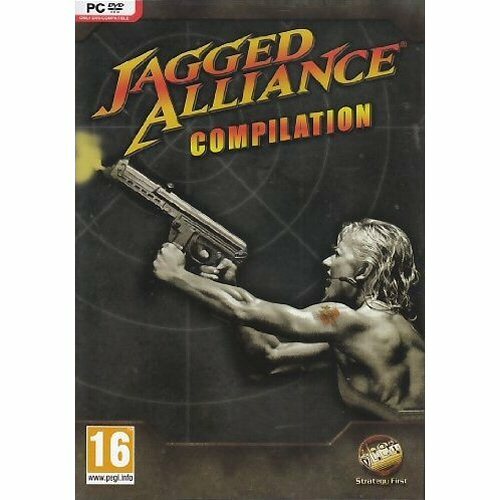 Buy Jagged Alliance Compilation for PC in India at the best price. Screenshots, videos, reviews available. Jagged Alliance Compilation contains Jagged Alliance, Jagged Alliance: Deadly Games, Jagged Alliance 2 and Jagged Alliance 2: Unfinished Business. Jagged Alliance features: 60 mercenaries... 60 attitudes... 60 voices; intense turn-based combat lets you plan every action; non-linear gameplay; three exciting levels of play will determine if you're as good as you think you are and a replay feature to look for Santino's Achilles heel - you'll need all the help you can get! An exciting game design approach - role playing and strategy - puts you in the thick of the action! The small country of Arulco has been taken over by a merciless dictator – and only you can loosen the iron grip! Jagged Alliance 2 Gold Pack features the wildly popular strategy title Jagged Alliance 2 and its mini-sequel, Unfinished Business for hours and hours of gameplay. Featuring an enhanced version of JA 2, Jagged Alliance Gold Pack immerses you into an elaborate role-playing universe where you will interact with more than 150 characters, recruit your own band of soldiers and create your own custom mercenary to win back Arulco – not once, but twice! The perfect blend of strategy, role playing and tactical combat! Over 150 individual in-game characters. More than 10,000 lines of digitized speech. Dozens of realistically modeled weapons. Create your own custom mercenary by choosing his/her abilities, skills and personality. Nonlinear gameplay lets you fight, rest, explore and plan as you see fit. Amazingly detailed environments with realistic line-of-sight and spectacular high-color, high-resolution graphics. Choose between reality or sci-fi gaming style. The smoke is clearing and the bullets have stopped flying. Arulco is free at last, but your jobs not over. An all-powerful corporation is assaulting the tiny country, and once again, you’re needed! Enter a whole new chapter of the critically acclaimed Jagged Alliance 2 with all new weapons, new mercenaries, new terrains and the fantastic new Mission Builder! Gear-up you’ve got some Unfinished Business to take care of! 10 new weapons including modern sniper and assault rifles! Import old characters from the original Jagged Alliance 2. Unfinished Business is a continuation of Jagged Alliance 2 but does not require the original. Ironman mode: Are you smart enough to beat it? New terrain tiles, including snow. New tactical features to aid in combat, including a Terrain Protection Indicator. Includes the same mission building program used by the game’s creators!